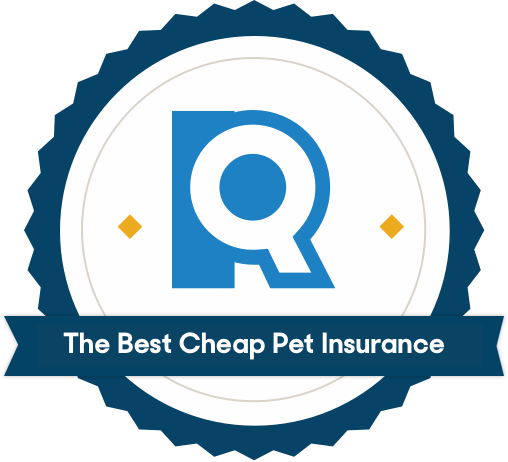 The best cheap pet insurance offers comprehensive coverage, no annual limits, and top-notch customer service. To help you compare your options, we took a deep dive into our top picks’ premiums, deductibles, and reimbursement options. But because your premium is unique to your pet, you’ll want to compare quotes from all three. The most important factor in a pet insurance policy is what it actually covers. Any number of costly medical conditions can come up with your pet, and we wanted providers that would cover all of them. In addition to the standard accident and injury protection, we went through policies with a fine-tooth comb to make sure they didn’t exclude any specific conditions like cherry eye or liver shunts. We also required continual coverage in all of our plans. That means if your pet’s receiving care for cancer or another chronic illness, it won’t stop at the end of your policy year. All pet insurance companies work on a reimbursement model — you pay the bill upfront, and they pay you back for approved expenses. That said, some companies use benefit schedules or “usual and customary” charges to determine how much they’ll reimburse. The issue with these reimbursements is that the company sets a limit for how much it’ll pay based on your pet’s diagnosis. That means if your vet happens to charge more than what they have designated for that condition, you’ll end up footing the difference. We eliminated any companies that didn’t base their reimbursement amount on what you actually pay to the vet initially. The best pet insurance plans also don’t put a ceiling on how much they’ll pay for specific conditions or incidents. While most plans have a general annual limit (usually around $10,000) that encompasses all of your vet fees for the entire year, some plans also have caps for individual expenses. For instance, if your dog gets into the garbage and needs surgery to remove something harmful, you might find out that only 20% of your $10,000 benefit can be used. We wanted policies that would have you covered no matter what comes up, so we cut any providers with these types of limits. As any pet owner can tell you, every pet will need prescription drugs at some point. Pet Health and Safety Coach Arden Moore told us that this coverage can make or break an insurance policy: “Many conditions require continual medication, which can quickly get expensive without this provision.” Prescriptions for issues like ear infections and stomach issues might only cost $20 per bottle, but that adds up fast if your pet has to be on them permanently. Unfortunately, this doesn’t apply to preventative medications like flea treatments, but anything your vet prescribes will be covered. Finally, we ranked each of our five remaining contenders on their customer service experience. We wanted to find out how it would feel to actually use their policies, so we called and emailed each company with specific policy questions, used their live chat features when available, and graded their websites on how easy they made it to find the answers to our questions. 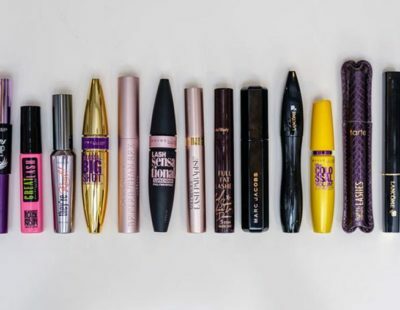 There’s no fine print when it comes to Figo’s unlimited coverage. It extends to exam fees, reimburses you within 30 days (compared to 60 days for both Healthy Paws and Trupanion), and even waives coinsurance and deductibles if your pet needs lifesaving care — features no other provider offers. Its broad coverage doesn’t hide any massive exclusions or long coverage waiting periods, either. If your vet says your particular dog or cat is likely to face an expensive illness throughout its life, such as hip dysplasia — a common (and costly) issue for big dogs — you’re going to need more coverage than someone who owns a pet with little risk (like an indoor cat). 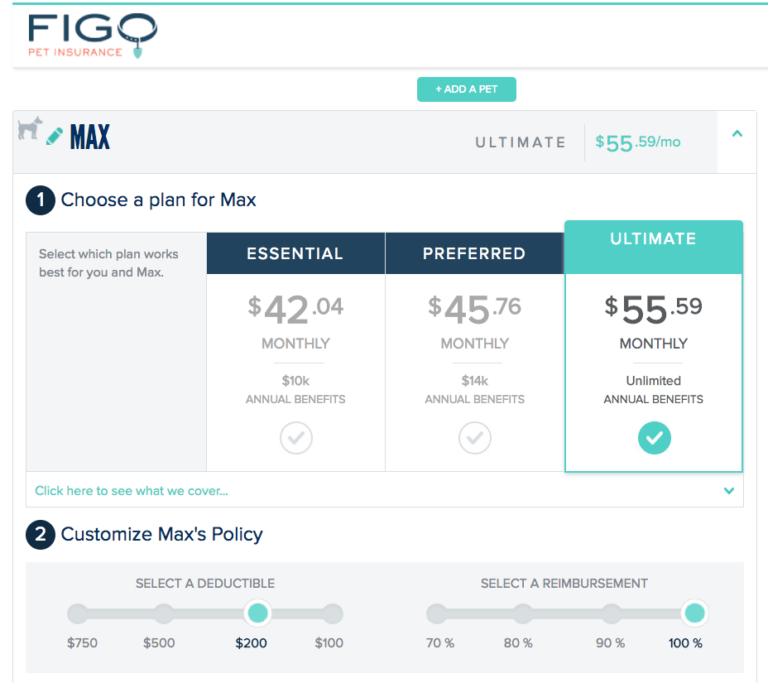 Figo enables you to tailor your coverage and monthly premium in a few ways. First, you can choose one of three base plans that offer different coverage and maximum yearly benefit amounts. We recommend the unlimited “Ultimate” plan; the Essential and Preferred plan come with a lower premium, but they cap out at $10,000 and $14,000 in yearly benefits, respectively. From there, you can choose among four annual deductibles and four reimbursement options. When we ran our sample pup through the process, the annual deductible we could choose ranged from $100 to $750. This range, however, will vary based on a number of factors including location, pet breed, and age; we saw deductibles as high as $1,500. To its credit, Figo was our only top pick to offer 100% reimbursement — an option that might pay off if you know your pet is liable to rack up several big bills over its lifetime. Figo’s generosity shines in its customer service, too. When we called with questions, a confident, assuring customer service representative picked up immediately and patiently answered our questions in full. It also offers a cloud-based storage system for you to file and track claims and upload your pet’s medical records all in one place. Say you’re out of town and your dog swallows her toy; you can use the smartphone app to find the nearest vet and quickly pull up her history to ensure the best possible treatment. We’ll be honest, it was hard to find anything to dislike about Figo. However, one thing we would have liked to see covered is routine wellness and preventive costs — things like rabies vaccines and preventive flea, tick, and heartworm medications. These are some of the most frequent expenses for pet owners but are surprisingly not covered by any of our top picks. If this is a dealbreaker for you, Nationwide was the best provider we saw that covered preventive treatment. Fair warning, though: We eliminated it because it reimburses on a benefit schedule rather than your actual vet bill, and it also has some pretty broad exclusions for pre-existing conditions. Unlike Figo, Healthy Paws only offers one pet insurance plan. 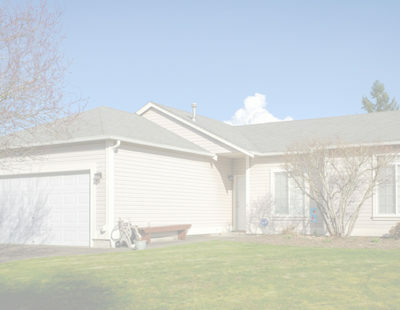 However, that plan doesn’t have any benefit payout limit and there are often many options for customization within it. Depending on the age of your pet, you can influence your monthly premium by choosing from multiple reimbursement options and annual deductibles. Like Figo, these ranges vary depending on factors like the breed of your pet and your location, but we found it easy to adjust until we found the right balance for our needs. When we requested quotes from each provider, we found that, on average, Healthy Paws offered the lowest monthly premiums, slightly edging out Figo. The difference is most stark for older dogs, making Healthy Paws a great place to start looking for pets four years or older (unless they have hip dysplasia — more on that below). The plan offers a 15-day waiting period for illness and injury coverage (besides hip dysplasia), the shortest of our top picks. A waiting period is the amount of time between when you purchase your policy and when your pet starts being covered. That means if you buy a Healthy Paws policy on June 1, you’ll be covered for any illness or injury starting on June 16. Healthy Paws has strict limits on hip dysplasia coverage. Hip displasia is an expensive genetic disorder that’s common in older dogs — statistics from the Canine Health Information center show that 72% of bulldogs and 70% of pugs are dysplastic. If you choose a plan with Healthy Paws, coverage for hip dysplasia isn’t covered at all if your pet is enrolled after they turn six. And there’s a year-long waiting period for that coverage to kick in if your pet is under six years old. Before enrolling, check with your vet to see how likely your dog is to develop hip dysplasia in its lifetime. Trupanion’s uniquely structured deductibles make it worth considering if your young pet is likely to develop expensive, chronic conditions over its lifetime. Rather than paying one deductible each year, you’ll pay one deductible for each condition or illness your pet faces in its lifetime. That may just pay off, depending on your pet. Let’s say you’re insuring a rottweiler — a breed particularly vulnerable to cancer. Chemotherapy alone can cost up to $10,000. All Trupanion plans have a 90% reimbursement, so you may end up paying $1,000 to $2,000 total (depending on the deductible you choose). After that, any cancer-related issues are covered at 90% for the rest of your dog’s lifetime, regardless of how many years of follow-up treatments are required. With an annual deductible, you’d have to pay off a new deductible every year your dog requires follow-up care. If you anticipate needing a prescription diet at some point for you pet, Trupanion is the only pet insurance provider we saw that will reimburse you for prescription pet foods and supplements prescribed by your vet. For prescription foods, Trupanion will pay for half of your pet’s food for up to two months every year as long as it’s recommended by your vet. Its policy for dietary supplements is more generous: These count under your primary policy, so you’ll be reimbursed for 90% of the cost. Trupanion is the only provider we saw that can pay your vet directly for pre-approved services instead of going through a time-consuming reimbursement process. According to Trupanion, this is only possible in situations where “arrangement to do so exists between Us and the treating Veterinarian.” If this convenience appeals, it’s worth calling Trupanion to see if your vet is included. Because of its unique deductible structure, Trupanion has by far the highest monthly premiums of any of our top picks. 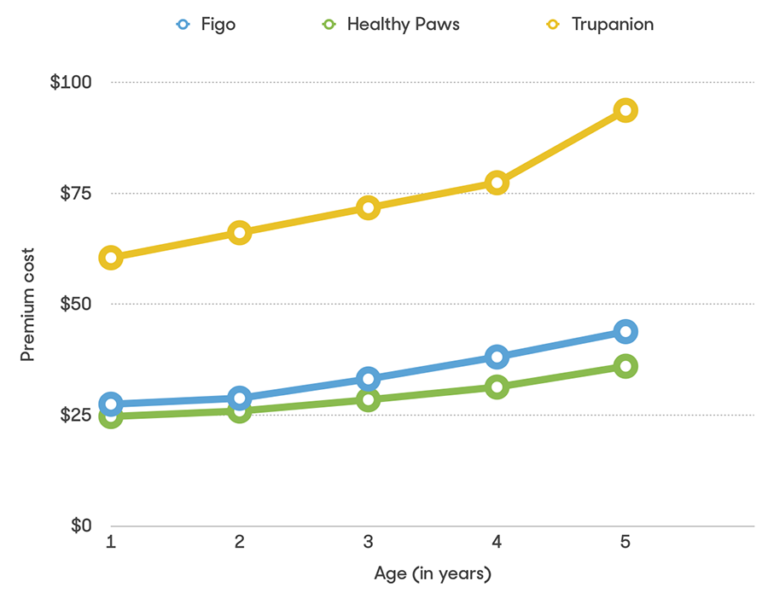 When we collected test quotes on different types of dogs, Trupanion had premiums nearly three times as high as Healthy Paws and Figo. It still costs about twice as much as the competition for one-year-old dogs, but it’s a strong contender if you anticipate a costly chronic condition for your furry friend. When you sign up with Trupanion, you’ll be reimbursed for 90% of all covered expenses (after you reach your deductible for that specific condition). That’s a generous amount compared to most providers, but it also contributes to higher premiums. We like how Figo and Healthy Paws both offer several options here so you can find the right balance between payment and protection. This probably comes as no surprise, but the younger your pet is when you purchase an insurance policy, the better. 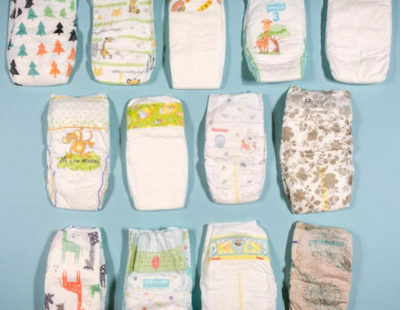 For one, the longer you wait, the more likely it is that your pet will develop a condition that could be called pre-existing, and thus not coverable. The best time to get insurance is when your pet is under a year old, but the “earlier is better” rule still applies if you adopt an older animal. Before you start collecting quotes from different providers, it’s a good idea to narrow down what conditions need to be covered in your policy. Your vet can give you some guidance here on what risks are most associated with your pet’s breed. This can help even if you have a mix — knowing your dog is part rottweiler means you’ll probably want an insurer that covers hip dysplasia and cancer, for example. Once you’ve homed in on the issues your pet might be prone to, ask your vet to list a typical price tag associated with each condition. This will help you determine the right deductible and reimbursement amounts for your specific pet. Most insurance providers offer a discount for paying your premium annually instead of monthly. If you can afford to pay it all upfront, this can be a significant source of savings on your premium costs. While you’re comparing quotes, make sure you check company websites for any available discounts. Figo was especially generous in this area: It provides discounts for insuring multiple pets, for adopting from an animal shelter or humane society, and for veterans or active duty military members. Is pet insurance worth the cost? Paying for pet insurance can seem like a lot of money when your companion is healthy. However, you never know when life will throw you a curveball. The first thing you should do before purchasing pet insurance is research your dog’s breed and any known health issues associated. If you have a mix breed, try to figure out what prominent characteristics are at work to help you determine what health issues might come up. Once you have a clearer picture of any possible health issues, you can decide if it’s more prudent to have pet insurance now or pay for it down the road. It also doesn’t hurt to shop around; take some time and gather quotes from as many providers as you can to help you determine the cost and how that fits into your life. What factors affect your pet insurance premium? According to the North American Pet Health Insurance Association (NAPHIA), the average annual premium payments for accident and illness plans totaled about $518 for dog owners and $321 for cat owners in 2016. Monthly, you can expect to pay between $30 and $50 in premiums. Before quoting your monthly payment, providers will take note of several factors to estimate how much your pet might cost to insure. Here’s what we found to have the largest impact after running multiple quote scenarios through our top picks. 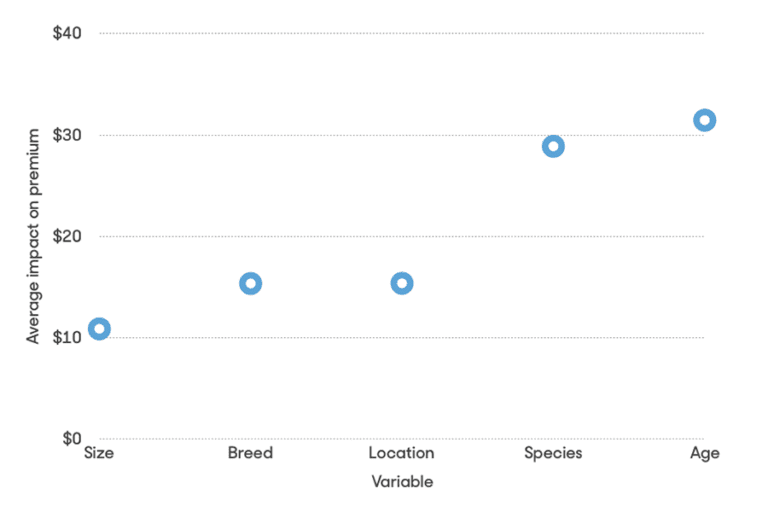 Age and species had the biggest effect on premium costs. Are you limited to "in-network" vets? Unlike their human counterparts, pets aren’t limited to seeing vets within their insurance company’s network. As long as you’re going to a licensed veterinarian or emergency clinic within the U.S., you won’t have any issues getting reimbursed. Are pre-existing conditions covered with pet insurance? Do providers consider spay or neuter status? Our top picks don’t ask for this info before giving a quote, but some providers do. Veterinarian Dr. Kathryn Sexton told us that’s because pets that aren’t spayed or neutered are prone to more health and behavioral issues.